Boulder, CO: The National American Indian Court Judges Association (NAICJA) is pleased to announce that a Memorandum of Understanding (MOU) has been memorialized establishing a working relationship between NAICJA and the National Council of Juvenile and Family Court Judges (NCJFCJ). Importantly, the MOU provides for joint membership in the two organizations, allowing NAICJA members access to the resources of both national judicial membership organizations. Established in 1969, NAICJA is a non-profit corporation and the only membership association of tribal court judges and tribal court personnel in the nation. NAICJA’s current projects and goals are concerned with: advocating on behalf of tribal justice systems; securing necessary funding for tribal justice systems so they may continue to excel; providing education and training to tribal judiciaries; providing networking and mentorship opportunities for tribal judiciaries; and improving cooperation between tribal, state, and federal judiciaries. The NCJFCJ, established in 1937, is a non-profit corporation with a primary focus on improving juvenile and family court system practice in the handling of cases involving children, families, and victims of domestic violence. As one of the oldest judicial membership organizations in the nation, the NCJFCJ is unique as a leader in providing continuing education, technical assistance, research, and policy development in the field of juvenile and family justice. Among the myriad current NCJFCJ initiatives, several align closely with NAICJA’s projects and goals and hold promise for potential application and implementation in Indian Country, including: a national network of more than 100 juvenile and family courts that develop and test promising practice; the Juvenile Drug Court Training and Technical Assistance Project; the Resource Center on Domestic Violence: Child Protection and Custody; and the Family Court Enhancement Project. Beginning on June 1, 2016, new or renewing members of the NAICJA interested in joint membership will pay a $215 fee directly to NAICJA (existing NAICJA members should contact NAICJA directly for details on upgrading to a joint membership). NAICJA is excited to join forces with the NCJFCJ as the two organizations work to strengthen the functions and collaborative opportunities of state and tribal court systems, especially as they pertain to juvenile and family courts. NAICJA encourages its members to take advantage of the joint membership opportunity and the incredible resources available from the NCJFCJ. 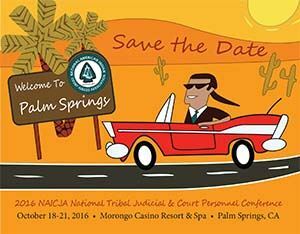 The National American Indian Court Judges Association (NAICJA) invites presentation proposals for the 47th Annual National Tribal Judicial and Court Personnel Conference which will be held October 18-21, 2016, at the magnificent Morongo Casino, Resort & Spa in Palm Springs, CA. NAICJA’s Annual Conference offers innovative and timely tribal justice information through high quality presentations by national experts. The theme of this year’s conference is, “Tribal Justice Matters: Role of Tribal Courts in Upholding Indigenous Rights.” NAICJA is featuring topics that highlight ways in which American Indian, Alaska Native, Native Hawaiian and First Nations justice systems are exercising and upholding tribal inherent rights. We are especially interested in presentations that focus on social justice and human rights, tribal sovereignty, international frameworks for understanding indigenous issues, promising Indian child welfare practices, court security and topics of interest to court clerks and court personnel. This is your opportunity to share your expertise and display your creativity by developing an original program for presentation. Proposals specifically tailored to meet the needs of the 300-person NAICJA audience are strongly preferred. Proposals are due on or before Friday, April 15, 2016 at 5:00 p.m. (MTN). Peacemaking is a traditional, community-based method that allows people to resolve disputes. 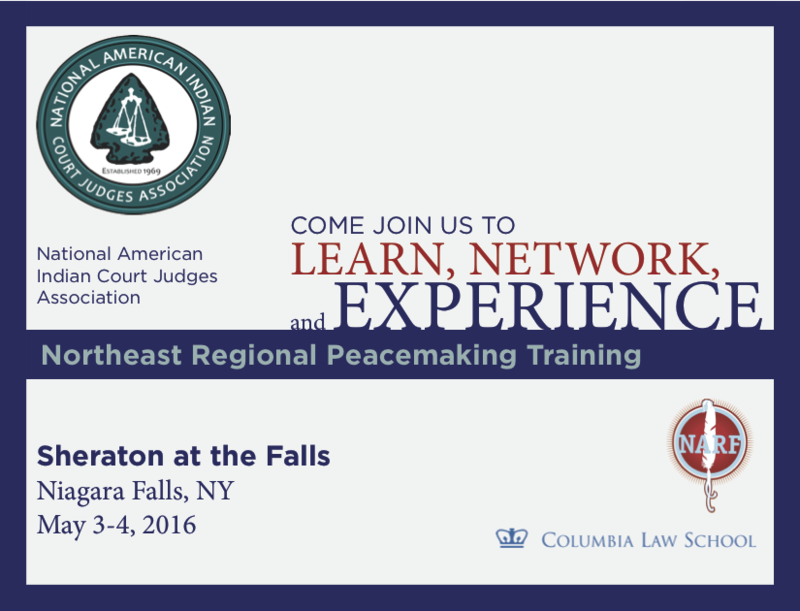 The National American Indian Court Judges Association, the Native American Rights Fund, and Columbia Law School offer this training that reviews foundational principles of peacemaking, peace circles, and traditional dispute resolution. While justice practitioners have been focusing on how indigenous peacemaking can help state and federal courts, this training brings the focus back to indigenous and tribal principles of peacemaking and how tribes are using and can use these methods in their own communities. One full day will be devoted to experiential training with peacemakers and notable faculty from across Indian Country. The Northeast Regional Peacemaking Training will take place at the beautiful Sheraton at the Falls in Niagara Falls, NY. NAICJA members receive a 10% discount! https://www.regonline.com/naicja to read about more details and to register for the conference. The conference theme is Tribal Justice Matters: Role of Tribal Courts in Upholding Indigenous Rights. The conference is open to the public with a fee discount available for all current NAICJA members. Last year's conference drew over 200 representatives from tribal justice systems and tribal governments in all ten NAICJA association regions as well as representatives from the non-profit, business, academic, and philanthropic sectors. Join our mailing list to keep informed on the latest conference news. The National American Indian Court Judges Association (NAICJA) invites presentation proposals for the 46th Annual National Tribal Judicial and Court Personnel Conference which will be held on October 6-9, 2015 at Seneca Niagara Resort Casino in stunning Niagara Falls, NY. NAICJA’s Annual Conference offers innovative and timely tribal justice information through high quality presentations by national experts. The theme of this year’s conference is, “Tribal Justice Systems: Pathways to Healing &Sovereignty.” NAICJA is featuring topics that highlight ways in which American Indian, Alaska Native, Native Hawaiian and First Nations justice systems are exercising tribal inherent sovereignty and envisioning their tribal justice systems to better effectuate healing and wholeness. We are especially interested in presentations that focus on promising Indian child welfare practices. We expected a conference attendance of approximately 300 persons from across the U.S.
April 3, 2015—all applicants will be notified about the status of their proposals.